We talk about the importance of mobile apps for small business quite a bit. But what about larger companies? What about companies with thousands of employees and billions of dollars in revenue? It turns out quite a few of these gigantic companies are utilizing iBuildApp for human resources app. 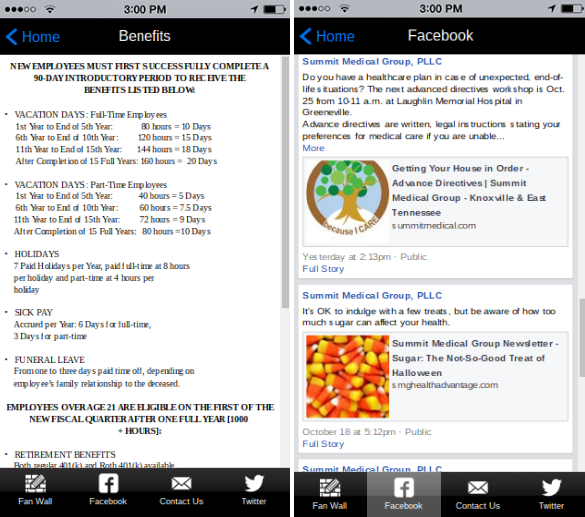 For example, Unilever has a simple, yet beautiful, mobile app for its HR in Jonesboro. Arkansas. To give you a refresher, Unilever trades publicly on the stock market, and it owns a wide range of brands such as Axe, Dove, Magnum, Heartbrand and Lipton. 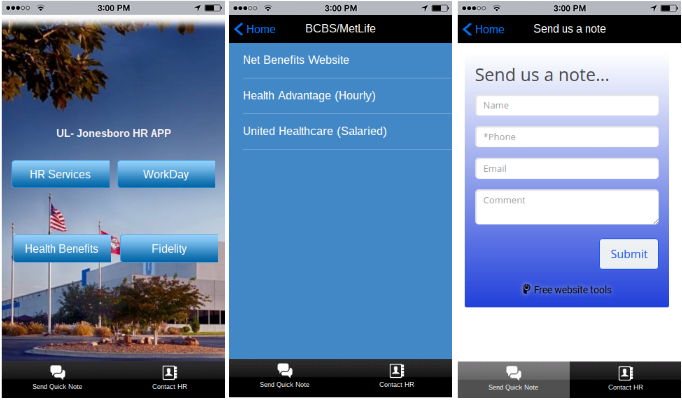 Unilever decided to generate multiple HR apps for each of their plants and divisions. Not only that, but it gives other businesses, regardless of size, a solid look into what they can do for their own human resources apps. What Does the Unilever HR App Look Like? You can take a glimpse at the app in the screenshot above. We also recommend testing it out by clicking through and walking through the different buttons and tabs. As you’ll see, the company didn’t include any hyper-advanced tools in the app. They keep it clean and simple for the employees, allowing the Jonesboro plant workers a chance to reach out to the HR team whenever they want. The reason this app works so well is because once all of the employees download it, they constantly have access to their benefits and HR information from a phone. One of the biggest problems with large corporations is that workers don’t feel like they have direct access to the HR team. Therefore, if they are having problems with another employee, or they’d like to discuss vacation time, the options are limited. However, a mobile app solves that problem, since it includes a list of all the HR contacts, their job titles and a full contact page for each person in the department. So, if you’d like to email or call the primary HR manager, it’s completely possible to do so. 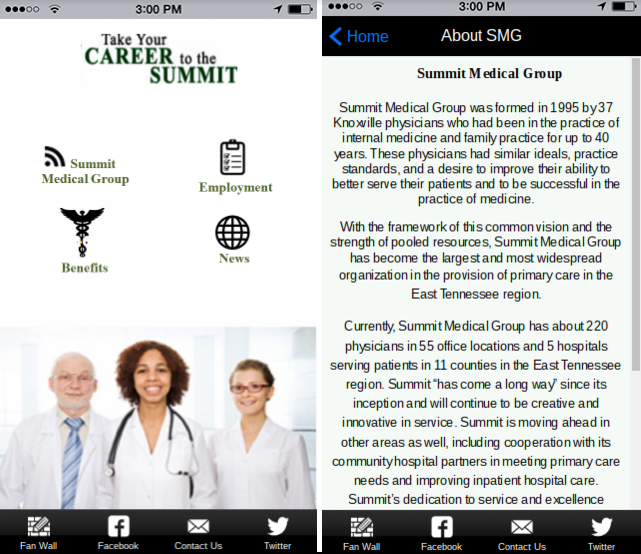 Healthcare juggernaut Summit Medical Group has a mobile app through the iBuildApp system as well. The company utilizes the app for HR purposes, but it’s mainly targeted towards bringing in new employees and sharing with them the information they need to know about the company. For example, one of the buttons reveals all of the About information people need to know about Summit. Therefore, potential employees get an idea for what they can expect when going in for an interview or starting on their first day. You can also find employment information, a list of all benefits from the company and a page for looking at the current news that mentions the Summit brand. As a job candidate, it helps to have all of this information in one place. For example, if you wanted to view the Summit fan wall or social media pages, it would only require a quick app download to have access to all of them on one page. Furthermore, the app has a Contact Us page for workers interested in directly contacting the HR department. Feel free to browse through the Summit app right here, and examine the app to see which of the elements are most important for you and your business. The HR apps above present an incredible combination of features that any HR department could implement. Unilever delivers essential contact information and benefits pages for its valuable employees, while the Summit Medical Group changes the way recruiting works, by consolidating brand information for those applying to the organization. 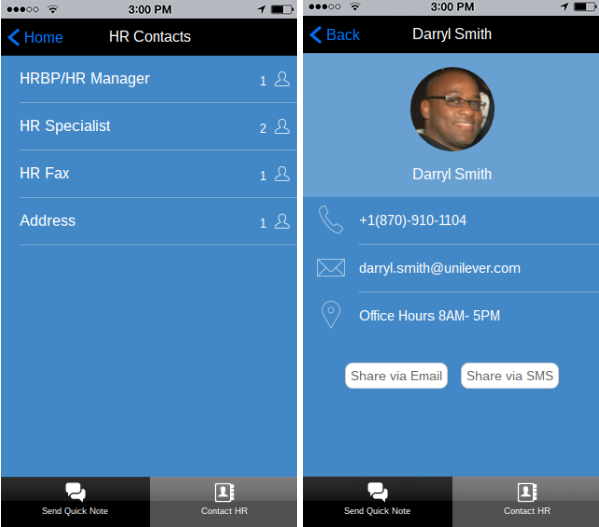 Has your organization tapped into the HR mobile app trend? If you’ve utilized iBuildApp for HR purposes, let us know about it in the comments section below.